Birth Daisy Thurley was born on 1 January 1915. Birth John William Thurley was born on 1 March 1926. Marriage He and Vera May Buckley were married on 26 March 1952. Marriage John William Thurley and she were married on 26 March 1952. Occupation George Henry Thurley was a journeyman and cabinet maker. Birth He was born in 1874 in in the Offords (nr Huntingdon), Hunts, EnglandBG. Occupation William Edwin Thurley was an Iron Turner, Foreman of a company making sports and playground equipment. Birth He was born on 25 February 1871 in Dogsdyke, Linconshire, EnglandBG. Occupation Annie Louisa Pullan was a Worsted Coating Mender in a Mill. Death She died on 8 September 1905 at age ~39 at 11 Moorgate Street in HallifaxBG. 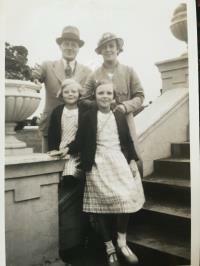 [PE] George and Glayds Thurley (nee Revill) with children Dorothy and Margaret. Burial George Thurley was buried at Lawnswood Cemetery in Leeds, Yorkshire, EnglandBG. Occupation George Thurley was a Post Office Supervisor. Birth He was born on 14 May 1902 at 4 Walker Street in Halifax, Yorkshire, EnglandBG. Marriage He and Gladys May Revell were married on 12 September 1925 at Burley Lawn Methodist Chapel in Burnley, LeedsBG. Death He died Died of a heart condition. on 8 October 1949 at age 47 at Leeds General Infirmary in Yorkshire, EnglandBG. Burial Gladys May Revell was buried at Lawnswood Cemetery in Leeds, Yorkshire, EnglandBG. Marriage George Thurley and she were married on 12 September 1925 at Burley Lawn Methodist Chapel in Burnley, LeedsBG. Death Arthur Johnson died on 13 August 1964 in Leeds, Yorkshire, EnglandBG. Death She died on 9 February 1877 in Halifax, Yorkshire, EnglandBG.